Day 2 tag is done. I really really like the dreamy feeling of this tag. Love the "make your own stamp pad" technique. I remember it from previous years. Pulled out the ones I had made, but decided to make a new one. 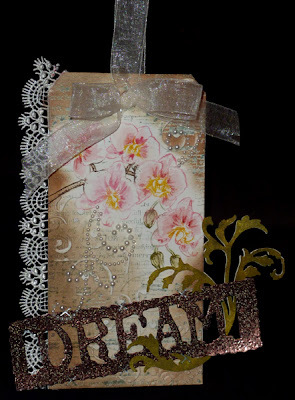 Love this orchid stamp from Flourishes. One of my orchids (same type) that I have a work, hasn't stopped blooming since last November. It really seems to like my office... It's got about 1 or 2 more buds and then we'll see if it blooms again for me. Anyway for this tag I die cut the tag from 90# watercolor paper. Made a mask of the orchid stamp, laid it on my tag. Inked up a musical text stamp (Hero Arts) with Distress Iced Spruce, and stamped over the mask, inked again for the little section it didn't reach. Clear embossed. Sponged Antique Linen and Frayed Burlap around the edges. Stamped the the orchid (Flourishes #150) and used a waterbrush to move some color, adding a bit of watercolor here and there. Used the Flourish (Sizzix #656973 set) and my hard rubber mallet to emboss the areas I wanted, then sanded the high points. 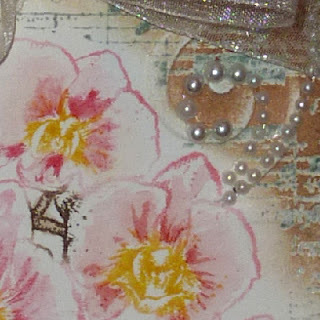 Adhered a piece of lace on the left side with Glossy Accents. Die cut the "Dream" word (Sizzix Tim's movers and shapers die) from white cardstock, applied some stamp pad ink and embossed with Rustique Tin (JudiKins) embossing powder. Embossed it again to get a good coating. Sponged various greens on some scrap cardstock and die cut with the Flourish Leaf (BossKut), re-inked with Perfect Medium and embossed with Distress Shabby Shutters embossing powder. Interwove the leaf flourish with the word and attached to card with a criss-cross pattern using Tim's Tiny Attacher. 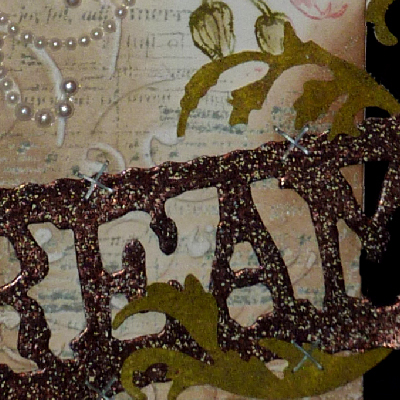 Added some pearl flourishes (Say it with Bling) and a big gauzy peg bow and hanger. I, too, love the dreamy look of this tag, but I especially love what you did with those orchids. I hardly recognized them. Gorgeous! This is beautiful. Love the flowers. Thanks for joining us at Do You Stack Up. This is a gorgeous piece of art. Thanks for sharing with Friends of Speedy @ Mark's Finest Papers. How pretty and feminine!! I really like the lace, those orchids, the flourish,.....I like it all! What great lyrics to accompany the beautiful tag! I love the sparkling letters! Thanks for playing along with us at DYSU. Beautiful job. I love the tag. Thank you for playing with the Southern Girls. Wonderful! there's something quite ethereal about this - I really love it!